Mike Davis may be the most ubiquitous trumpet player in New York City. On any given night, you are likely to see him playing with Glenn Crytzer and his Famous Orchestra, sitting in Dandy Wellington’s band, woodshedding at Mona’s, or leading his own group, the New Wonders. 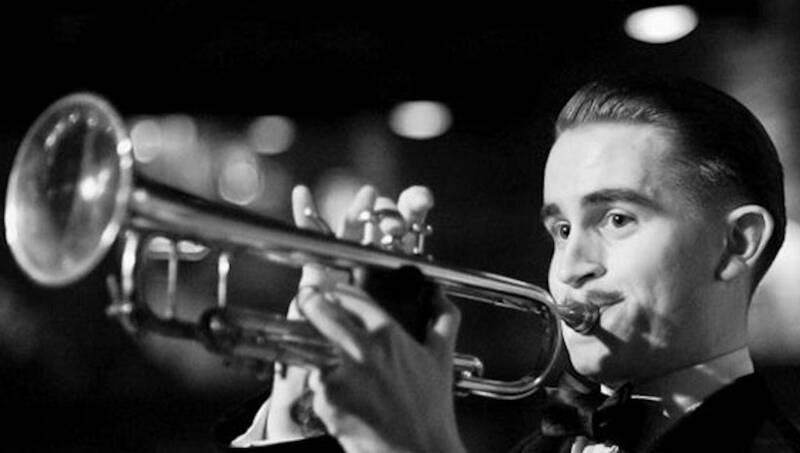 If a traditional jazz trumpet player is needed, a call goes out for the dapper Davis, who also plays trombone and sings Jazz-Age songs melodiously and in a period-correct style. Incredibly, his teachers at the Manhattan School of Music tried talking him out playing the music he loves. Davis says every time he learned a classic song, like “I Can’t Give You Anything But Love,” he found a paying gig, something his professors couldn’t believe. “That started my life in between how much I enjoyed that and how much active discouragement I was getting from the school like ‘you can’t do this’ and ‘no one wants to hear this,’ or ‘that music is old and irrelevant’ and ‘you’ll never make it.’ I developed a real chip on my shoulder. I concluded that I had to do my own musical research,” Davis said. He said his jazz history professors just paid superficial “lip service” to contributions and music of Duke Ellington and Louis Armstrong. The perspective that old music didn’t matter did not sit well with the young jazz musician. “[It] was so slanted towards [the idea] that nothing matters before John Coltrane and I thought that I have to educate myself because this is not the whole truth,” Davis said. Davis’s parents raised him with classical music, as they were members of the Seattle Symphony. He picked up the trumpet and began playing jazz in school bands. As he searched for colleges, his parents told him if he wanted to play music, he should attend a music college. Davis loved jazz and thought applying as a jazz major at the Manhattan School of Music would help him achieve his dream of becoming a professional jazz musician. But Davis said his classes left him cold. The professors taught him music that was either “obnoxiously complex and academic” or “totally out in left field with no rules at all.” He tried his best and practiced the homework they assigned. Then Davis saw fellow trumpet player Drew Nugent’s jazz band perform in Philadelphia. He says he had never heard a band playing 1920s music that way, trying to sound like the old 78-rpm records he had heard. It wasn’t the Dixieland revival sound that became popular in the 1950s. To Davis, this music felt alive and invigorating. Davis’s education quickly migrated from the hallowed halls of academia to the brick walls and tight space of a New York City tavern where Tuesday night jam sessions offered the college junior both undergraduate and master’s lessons in hot jazz. The informal schooling at Mona’s led Davis to paying gigs with jazz bands throughout the Big Apple. The opportunities just kept coming for him while his fellow music school graduates struggled to find work. “They [musicians at Mona’s] not only let pretty much anybody sit in who is polite and asks, but they let you sit in even if you don’t know the songs. And I’m lucky to have had that. We’re all lucky to have that right here in town every week. Look at what those guys are doing. I mean they deserve a lot more credit for educating young musicians,” Davis said. Playing as a sideman in groups big and small pays the bills, but Davis exercises his creative side by being the leader of his own band, the New Wonders (named after Beiderbecke’s Conn cornet model). However, the mantle of “bandleader” doesn’t sit easy with Davis. “I don’t like being in charge. I don’t like being a leader. I don’t like the responsibility. I’m terrible at self-promotion. I’m not a good schmoozer but it sort of fell to me because I had all of this music built up that I wanted to play. I had stylistic goals for playing songs that we know a certain way and I got more and more interested in arranging. So I could only do that if I’m in charge,” Davis said. So far, Davis has been happy with the performances of the seven-piece New Wonders. He recognizes that seven people can take up a lot of space in small New York City clubs. Sometimes room size means having to do without a piano or a trombone and that can impact the music. Davis, as bandleader, tries his best to direct the solos and keep the length of each tune concise, like those 78-rpm recordings he loves. Davis also understands that if his new band is to flourish, he may have to pass on sideman work. It takes time to telephone and email owners of nightclubs, bars, and restaurants seeking a venue for the band. The music doesn’t arrange itself either. He can spend hours writing charts that keeps his musicians, and audiences, on their toes. There is also an album for the New Wonders in production. They recorded the tracks last November and it is currently being mixed and artwork is being designed for the CD. Davis has final say but all of that work is out of his hands, which makes him a tad uneasy. He hopes the album will help give the New Wonders a wider audience. When audiences do see Davis play, whether with his own band or with others, it is often not just his outstanding phrasing on the trumpet that grabs a listener’s attention. Davis has been dubbed “a dandy” for his sartorial choices. He, along with fellow NYC musicians Dandy Wellington and Michael Arenella, were featured in the book I Am Dandy, written by Nathaniel Adams with photography by Rose Callahan. The photos in the book show Davis in vintage finery right down to a Bunny Berigan-like pencil mustache. He says it’s an honor to be featured for his personal style. “I think every single person in the book does interesting things with expressing themselves with their clothes. And there aren’t really any other outfits in that book that I would copy because they’re so personal. I think that’s a fun thing and it’s a very similar idea to me to having a personal voice improvising on an instrument,” Davis said. The attraction to a vintage look came after his discovery of pre-war jazz. Davis said he began just emulating the musicians he saw in photographs like the sharply dressed Jean Goldkette orchestra and Louis Armstrong in his 1920s and 1930s publicity pictures. Like the music itself, he found the wardrobe to be a perfect fit. More work came to him because the people who hired him knew he’d be well dressed. It also distanced him further from his music school peers. “I had had enough with music school and I thought the music they were selling me was so soulless. And they’re still trying to persuade me away from playing music that did speak to me and toward playing music that didn’t speak to me. I concluded that I wanted to play the kind of jazz I like—all the time—to the exclusion of any music that I don’t like, if I could. And that’s what I have done. Then I decided I wanted to dress like that all of the time too,” Davis said. It’s his attention to detail, and a passion for authenticity, in both music and dress, that has provided Davis a spot in the New York music scene. With his horn, he demonstrates that success is the result of sticking by your instincts no matter what “the experts” may tell you. Visit his website at www.mike-davis-jazz.com. Brian R. Sheridan, MA, is the chair of the Communication Department at Mercyhurst University in Erie, PA (hometown of Ish Kabibble) and a longtime journalist in broadcast and print. He also co-authored the book America in the Thirties published by Syracuse University Press. Sheridan can be reached at bsheridan@mercyhurst.edu. Find him on Twitter @briansheridan and Instagram at brianrsheridan.